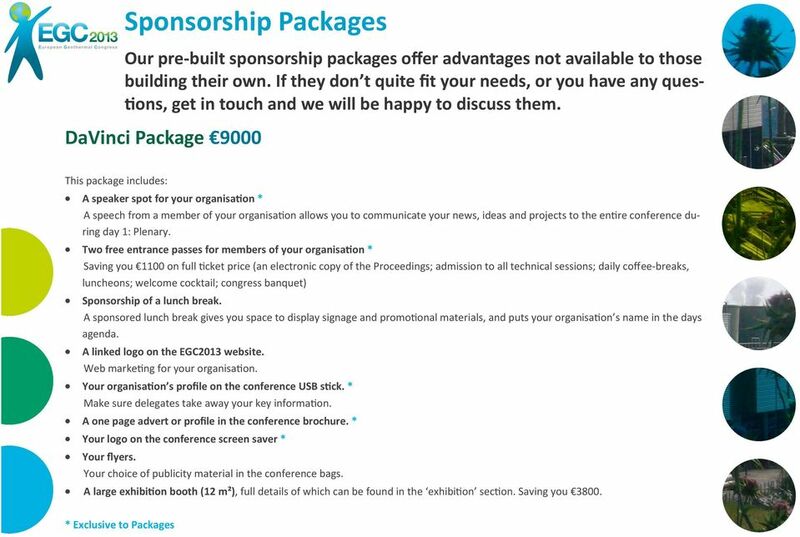 Download "Sponsorship Packages. 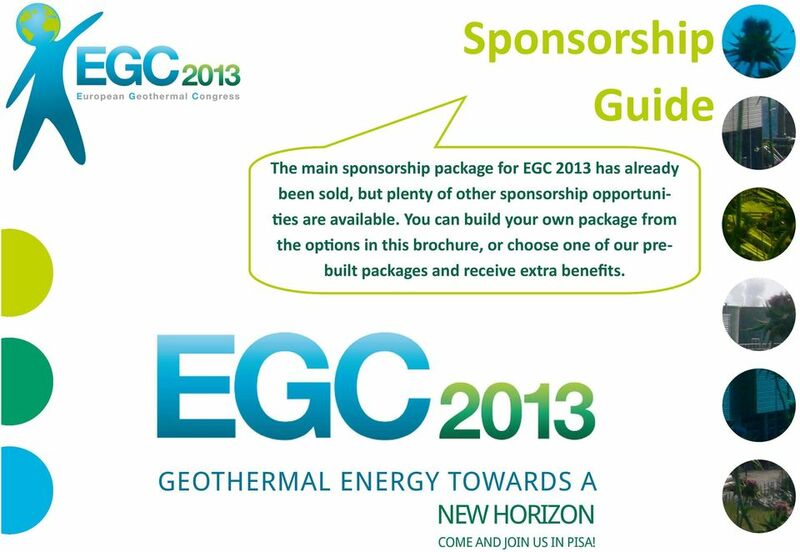 DaVinci Package 9000"
1 Sponsorship Guide The main sponsorship package for EGC 2013 has already been sold, but plenty of other sponsorship opportunities are available. You can build your own package from the options in this brochure, or choose one of our prebuilt packages and receive extra benefits. 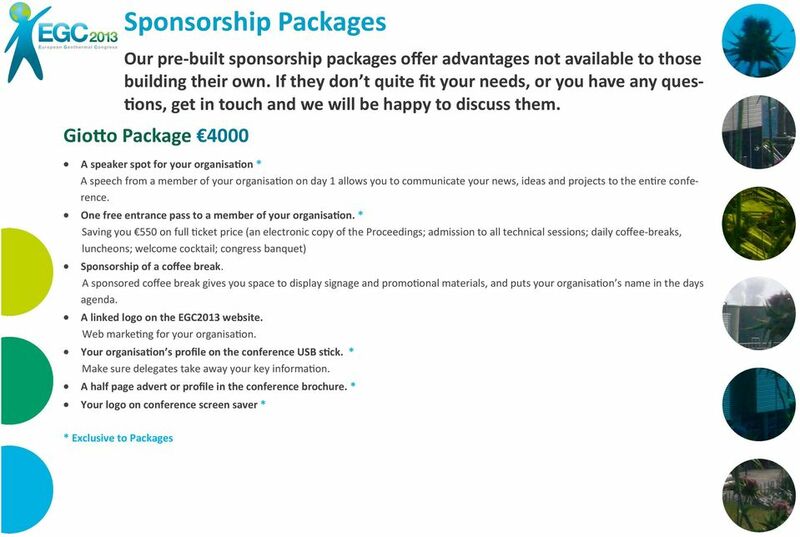 2 Sponsorship Packages Our pre-built sponsorship packages offer advantages not available to those building their own. If they don t quite fit your needs, or you have any questions, get in touch and we will be happy to discuss them. DaVinci Package 9000 This package includes: A speaker spot for your organisation * A speech from a member of your organisation allows you to communicate your news, ideas and projects to the entire conference during day 1: Plenary. Two free entrance passes for members of your organisation * Saving you 1100 on full ticket price (an electronic copy of the Proceedings; admission to all technical sessions; daily coffee-breaks, luncheons; welcome cocktail; congress banquet) Sponsorship of a lunch break. A sponsored lunch break gives you space to display signage and promotional materials, and puts your organisation s name in the days agenda. A linked logo on the EGC2013 website. Web marketing for your organisation. Your organisation s profile on the conference USB stick. * Make sure delegates take away your key information. 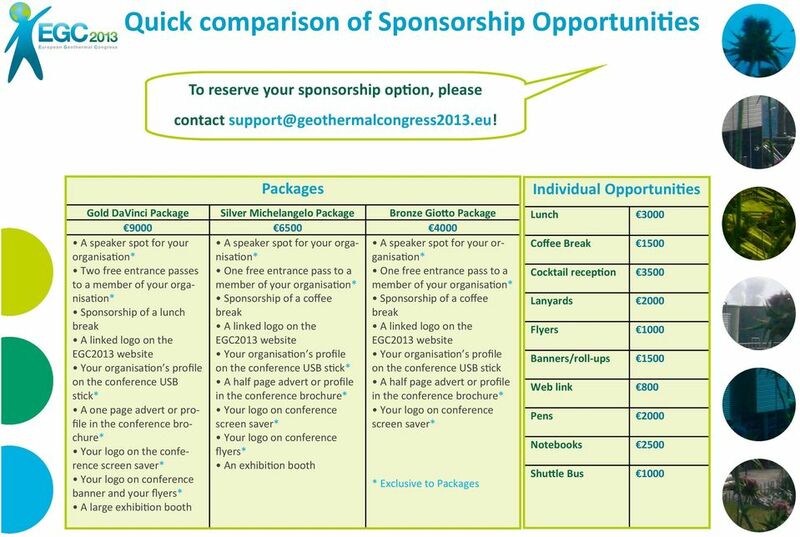 A one page advert or profile in the conference brochure. * Your logo on the conference screen saver * Your flyers. Your choice of publicity material in the conference bags. A large exhibition booth (12 m²), full details of which can be found in the exhibition section. Saving you 3800. 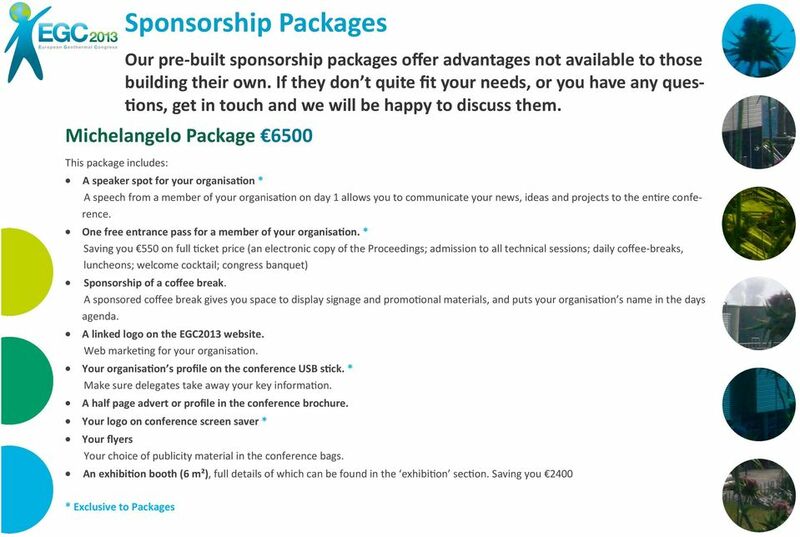 5 Individual sponsorship opportunities You can choose an individual item to sponsor, or build your own package from the items below. 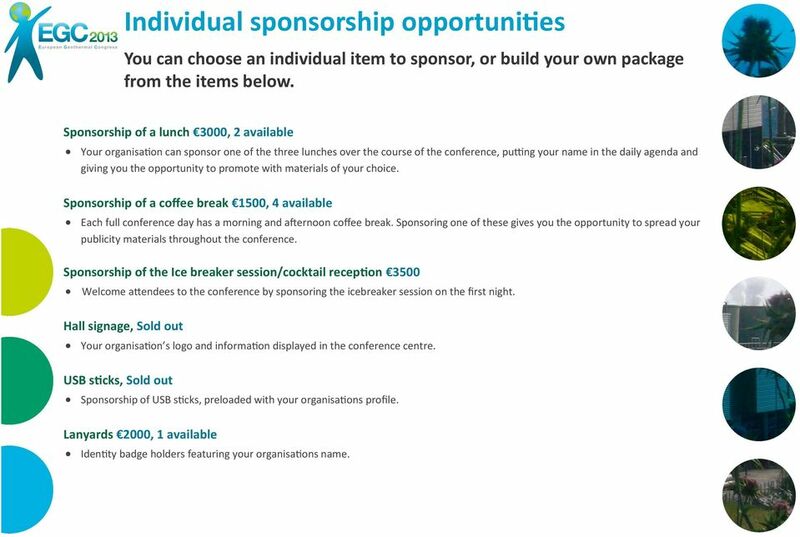 Sponsorship of a lunch 3000, 2 available Your organisation can sponsor one of the three lunches over the course of the conference, putting your name in the daily agenda and giving you the opportunity to promote with materials of your choice. Sponsorship of a coffee break 1500, 4 available Each full conference day has a morning and afternoon coffee break. Sponsoring one of these gives you the opportunity to spread your publicity materials throughout the conference. Sponsorship of the Ice breaker session/cocktail reception 3500 Welcome attendees to the conference by sponsoring the icebreaker session on the first night. Hall signage, Sold out Your organisation s logo and information displayed in the conference centre. USB sticks, Sold out Sponsorship of USB sticks, preloaded with your organisations profile. Lanyards 2000, 1 available Identity badge holders featuring your organisations name. 6 Individual sponsorship opportunities You can choose an individual item to sponsor, or build your own package from the items below. Flyers 1000, Limited availability Your choice of publicity material in the conference bags. Banners/Roll-ups 1500, Limited availability Your organisation s pre-printed banner displayed in the main conference hall. Web link 800, Limited availability A linked logo on the support page of the Congress website. Pens 2000 Branded pens given out to conference delegates Notebooks 2500 Notebooks for attendees with your logo Conference Agenda, Sold out Sponsoring the printing of the conference agenda for high visibility. Shuttle Bus 1000 A shuttle bus will transport delegates to and from the conference centre and hotels outside Pisa city. a family gathering 20th-22nd May 2016 Barcelona Spain Sponsoring Information J and Beyond 2016 J and Beyond is the International Conference for Joomla! developers and site integrators from around the world. 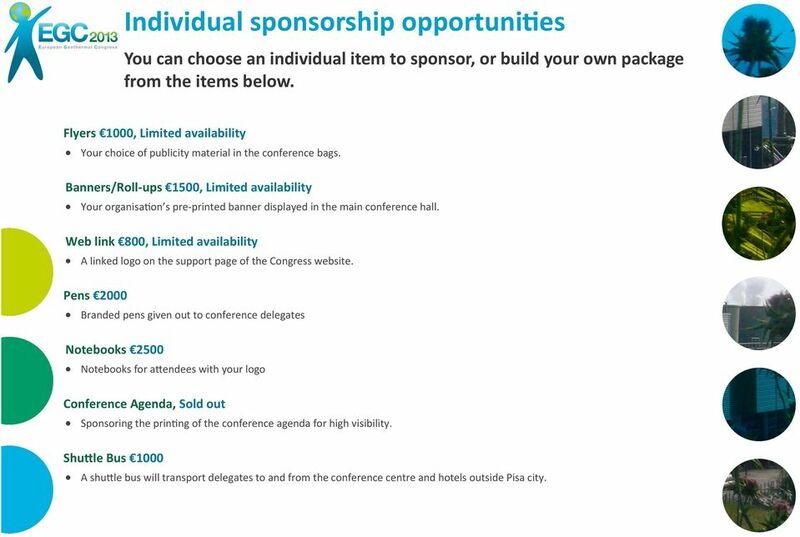 2015 SPONSORSHIP SUMMARY PLATINUM - ONSITE EVENT GUIDE SPONSORSHIP.. $7,500 PLATINUM - ATTENDEE BAG SPONSORSHIP.. $7,500 PLATINUM - BADGE HOLDER SPONSORSHIP. $7,500 PLENARY - OPENING MONDAY SPONSORSHIP.. The SASNM was founded in 1974. It has since grown to an organisation of approximately 180 members. EXHIBITORS AND SPONSORS KIT 24th The is THE preeminent international gathering of political scientists working in academia, research and consulting who present their research over 5 days and 600+ panels. Connect 16. The Christian Venues Association is preparing for it's biennial National Conference at Alexandra Park Conference Centre in 2016.